The best first: What is red and goes up and down? A tomato in an elevator. Did you know that UPS and Fedex are going into a merger? They will be called Fed-Ups now. I love my rock-hard, honed six-pack so much I protect it with a good layer of lard. You should always keep your cool when handling justice. Otherwise it would become justwarm. 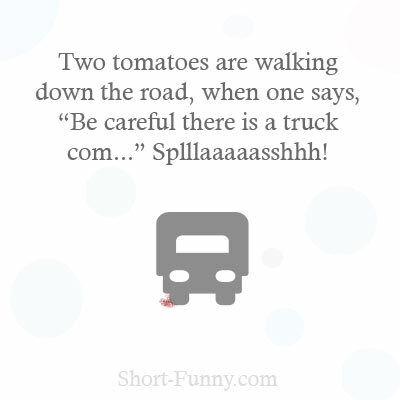 Two tomatoes are walking down the road, when one says, “Be careful there is a truck com...” Splllaaaaasshhh! The hipster from next door drowned. He went ice skating before it was cool. Not even orcas dare attack an octopus. I wanted to wear my camouflage jeans today but I just couldn’t find them. I was told I pick my nose at times. I mean, why would I do that? I’ve still got the one I was born with! Cannibals aren’t very sociable. They’re all fed up with people. Doctor, do these sleeping pills create an addiction? Absolutely not, no worries, I myself have been using them daily for years! I don’t know why people have a problem with wigs. It’s a look anybody can pull off! 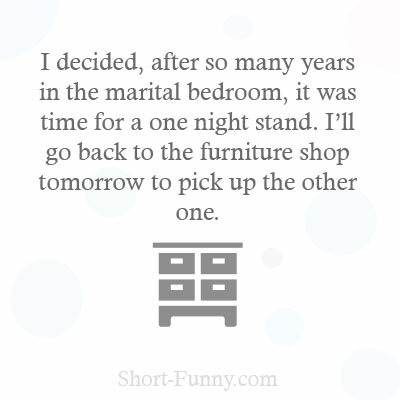 I decided, after so many years in the marital bedroom, it was time for a one night stand. I’ll go back to the furniture shop tomorrow to pick up the other one. Two cows meet, one says, "Mooooo!" The other one is offended, "Hey, I just wanted to say that!" Two penguins meet. One says, “Jesus it is cold today. Why didn’t the Orange drive when the lights turned green again? Vegetarian is an old Indian word. Originally, it means “a bad hunter”. It was in a rush to get to the bottom.